By in Uncategorised on 4th January 2016 . Greg is a Technology Engineer III working in the Integration Team for the BIT Data Center. He joined the Integration team in 2013, transferring from Development where he worked as a software engineer for nearly 10 years. istering SharePoint which is used by over a dozen agencies to document and coordinate internal business processes. 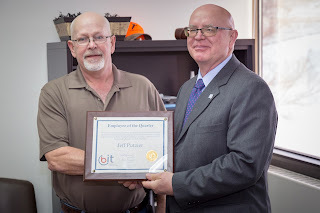 Recently, he has been a valued contributing teammate within BIT’s new Policies and Procedures site, producing proof of concept documentation of items that were not previously implemented on SharePoint in the State. He also supported his teammates in 2015 by tracking and maintaining progress reporting for the Microsoft Windows Server 2003 migration effort, as well as taking the lead to better report and track license compliance. njoy life with their two sons, Lucas and Alex, and daughter Ashley. James is a Software Engineer IV for the Development division of BIT. James’ primary day-to-day responsibilities include development and support of two critical DOT systems, the Roadway Information System (RIS) and the funding module of Concept To Contract (C2C). Thus, James is the resident expert on Mileage Reference Markers (MRM) and electronic funding requests to and from the Federal Highway Administration (FHWA). Recently, James has taken on the role of scrum master. The scrum master is the facilitator/coach of a team of developers that utilize the scrum development methodology for creating applications. Originally hired in July, 1991 as a DOT employee to be an application developer, in March, 1996 he accepted a position in Sioux Falls with the Board of Regents writing applications for Dakota State University. He couldn’t stay away from Pierre, though, so he came back to work for BIT in May, 2004. He has been a valued member of Team 6 ever since. James grew up in the Lennox area and is married to Joanne who is a librarian at Rawlins Municipal Library. They have a very active 8th grade daughter named Margo who plays in the band, runs cross-country and track, and likes to hit softballs around in the summer. During his spare time, James enjoys doing home improvement projects, working on cars, and attending air shows. Jeff started his career with BIT in 1996 as a network technician. Since then, Jeff has been a specialist, analyst, and currently serves as a Technology Engineer IV. Jeff has been and continues to be an outstanding asset in areas of design, integration, and continued maintenance of the DDN Video Network. His commitment to excellence with maintaining the existing design platforms in conjunction with his dedication to research, test, and implement new ideas and technology that are above and beyond his job requirements has earned him the spot of Employee of the Quarter. Jeff has “get it done” AND “get it right” attitudes that clients and co-workers admire. Outside of work, Jeff demonstrates the same commitment of excellence cooking. Currently, Jeff owns and operates a popular small BBQ catering business known as “Burnt Offerin’s.” Aside from cooking, he also enjoys playing competitive pool and cheering on the Green Bay Packers! Jeff, thank you for your commitment and service to BIT/DDN Video. 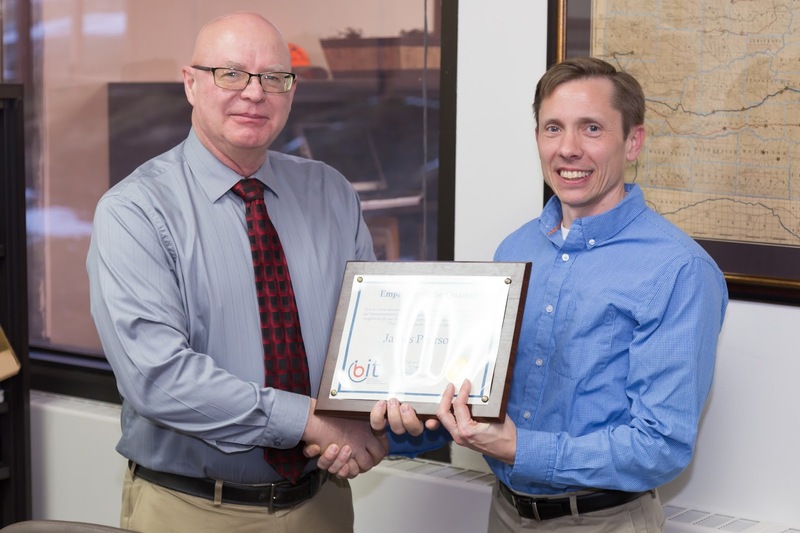 Ryan Ogan has been recognized for his high standards of excellence in project management. Ryan is a Project Manager on BIT’s Project Management Office (PMO) team. 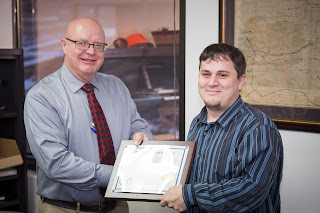 Ryan is able to provide his top notch customer service to state agencies due to his previous technology experience. Ryan came to BIT a year ago from the South Dakota Board of Regents, having provided over sixteen years of service to the State of South Dakota. 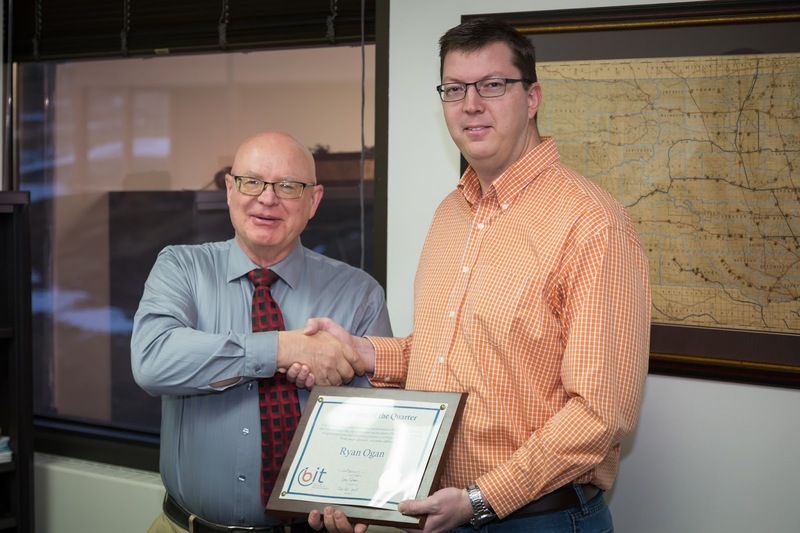 Ryan quickly established himself as a valued project manager at BIT. He is often requested by other BIT Managers to lead their technology projects since he skillfully organizes and facilitates projects ensuring staff assigned to tasks are held accountable, budgets are not exceeded, and deadlines are met. He adds value to the project teams he serves by addressing issues, establishing procedures, and keeping the project team informed with his excellent communication skills. He has met with every state agency on our statewide software licensing project. Other projects he has served as project manager include the Department of Environment and Natural Resources FoxPro rewrite, Department of Corrections COMS thin application installation, BIT’s Windows 10 planning, and other technology investigatory efforts. Ryan has built upon his customer service skills through his history and technology background with the Board of Regents along with his BIT experiences. The Board of Regents have collaborated with BIT on several projects, which allowed Ryan to join BIT with relationships already established with key technical staff. He also has become an asset to the PMO team by contributing his past experience, easily translating technology jargon for agency clients, and by helping other staff see issues through an I/T engineering viewpoint. Ryan’s vast technical background in networking, support, and other technology infrastructure components have benefited the PMO team immensely. A native of Pierre, Ryan and his wife, Nicole, have two sons, Jamie, 9 and Alex, 6. His family enjoys camping, hiking, and spending time outdoors. In his spare time, Ryan enjoys riding his Harley, cheering for his beloved Washington Redskins, and spending time with his family.